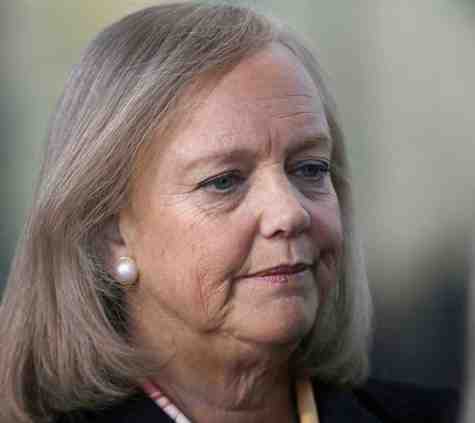 Somebody’s gotta pay for the Brobdingnagian salaries, stock options and the private jets of HP CEO Meg Whitman (yeah, she of the failed California gubernatorial bid after spending $140 million) and other top executives of the company. HP today said it’d fire another 11,000-16,000 employees. The job cuts will cover all divisions and geographies. HP expects to save a billion dollars on the additional layoffs over and above the $3 billion to $4 billion the company anticipated previously for slashing 34,000 jobs. Over the last two years, HP has steadily upped the number of employees it’s going to jettison. In May 2012, HP disclosed plan to guillotine 27,000 employees. By September, the number of HP jobs at risk had increased to 29,000. Come December 2013, the number rose to 34,000. If you take the 16,000 impending layoffs, Meg will have butchered a total of 50,000 jobs. In May 2012, HP adopted a multi-year restructuring plan designed to simplify business processes, accelerate innovation, lower costs and deliver better results. HP previously estimated that 34,000 positions would be eliminated in connection with the plan. As HP continues to reengineer the workforce to be more competitive and meet its objectives, the previously estimated number of eliminated positions will increase by between 11,000 to 16,000. HP currently employs about 317,500 people around the world. Meanwhile, HP reported lackluster results for its fiscal second quarter ended April 30. Revenues of $27.3 billion were down 1% over the same period last year. Net earnings for the quarter rose 18% to $1.3 billion. Most HP divisions did poorly in the quarter. Except for Personal Systems revenues, which were up 7%, HP’s other divisions were unimpressive when compared to the same quarter last year. Revenues from the Printing division were down 4%, Enterprise Group was down 2%, Enterprise Service revenues fell 7%, Software was flat while Financial Services was down 2%. HP completely missed the huge boom in consumer mobile devices that its Silicon Valley rivals Apple and Google have richly capitalized on. HP’s forays into the tablet segment has been a terrible disaster. On smartphones, HP launched two so called VoiceTab devices four months back in India that made little impact.